Wed., March 20, 2019, 5 a.m. It happens every year at tournament time: Some national television person ticks me off. Actually, it’s usually multiple people. I think in TV terms, they call that a gaggle of broadcasters. Or maybe it’s a cackle. I forget. Most of the time, it’s about Gonzaga and how they pronounce it – I mean mispronounce it. Other times, it’s about how they butcher saying Spokane. In some rare circumstances, it’s literally both … and that’s when my head explodes in a phonetic fit. Pronunciation matters, and people with studio-quality hair who stand in front of cameras know this. So, say our names correctly, OK? I can even include a handy guide for you with this column, if that would help. If you can’t say Gonzaga right, just wait until you see Coeur d’Alene or Pend Oreille on the teleprompter. That’s gotta be a real clinch-moment when you’re on live TV. Normally, it’s pronunciation problems that fire me up when I’m watching the NCAA Tournament. And normally, these national TV people don’t get me all riled up until at least our first opponent has been determined. But we got a head start this year. From an unlikely place: Jimmy Kimmel, the late-night talk show host. He comes on pretty late around here, sometime after my kids go to bed and when the internet starts to work again in my house. I grew up thinking David Letterman was a national hero, so Kimmel is a much more comfortable fit for my largely middle-school sense of humor than the other things that come on after KHQ’s Blake Jensen tells me that it’s going to be unseasonably cold for the 287th-straight day. Besides, Kimmel was a key cog in the likely forgotten Comedy Central show “The Man Show,” which almost certainly was too inappropriate and politically incorrect to ever air again … and may have occupied a whole lot of hours in a previous lifetime. The post-college version of me loved the almost masterful way that show seamlessly weaved between celebrating the goofiest parts of having a certain chromosomal make-up, while coyly mocking the worst in stereotypical male behavior. His edgier humor, mixed with a unique ability to stand up for things that matter in a way that doesn’t feel completely out of place on a late-night comedy show, works for me. More importantly, he has fantastic pronunciation. I’m telling you, this guy can really enunciate. So when Kimmel launched into his monologue on Monday night and began talking about March Madness and the No. 1 seeds, we were in for something both wonderful and rare: a national broadcaster who can say Gonzaga correctly. First, he made fun of office pools and the people who only pay attention to college basketball at this time of year but think they know a lot about it. That was fine. Not relevant here. But fine. Then he made fun of Duke. I liked that. So did the studio audience. Really, the whole nation cheered at that joke. Then he mentioned Gonzaga, and I’m telling you, he nailed it. Thayne McCulloh and Mark Few couldn’t have said it more perfectly. Then he went to another place – a little theory of his. The crowd laughed. My eyes squinted a bit, while my head turned to the side. You know, kind of like when your dog is a little confused or knows you’re eating cheese. Same look. “I’ve never heard the word Gonzaga outside of college basketball. I don’t know where it is. I don’t know anyone who went there. I don’t even know anyone who knows anyone who went there. This sets up his punchline. Maybe that joke is funnier when you don’t live less than 100 miles from the Canadian border. Or maybe my friends who say they have girlfriends in Canada aren’t telling the truth. Either way, that’s a column for another day. Every basketball season, I’m reminded by social media that Gonzaga is a bit mythical to folks not from around here. I can’t even count how many times someone posts “I didn’t know Gonzaga was in Spokane” on my Facebook wall. Still, the joke rubbed me a little wrong. Kimmel went to the University of Nevada, Las Vegas, and though he never graduated from UNLV, he’s basically beloved there. It’s reciprocal. So this is a guy who gets what it’s like when people don’t understand your hometown college. There’s really no reason to play to the lowest common denominator, is there? Besides, we all know, it was just for a laugh. During his days with the Lakers, Gonzaga graduate Adam Morrison sometimes ended up on Kimmel’s show. It was for laughs, but Morrison took it in good nature. So, we should make up. No grudges. Anything can happen in the NCAA Tournament, but the majority of people who have filled out a bracket have the Zags making it to the Sweet 16. Let’s be honest, most have Gonzaga going further than that. But for the sake of argument, let’s focus in on the Sweet 16. It’s in Anaheim. Anaheim is about 30 miles from Kimmel’s studio in Hollywood. If you’ve ever driven from Orange County to Los Angeles, you know that’s only about a four-hour drive. Still, for this moment, it’s worth it. 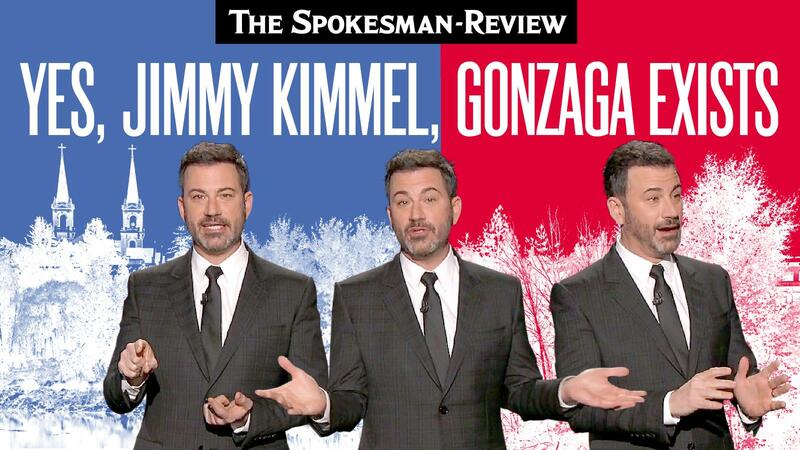 If everything goes as it should, what do you think about a bunch of folks from Gonzaga and Spokane stopping by the “Jimmy Kimmel Live!” studio on Monday, April 1? We’ll prove it to you that this place is not only real, but worth more than just a joke on your show. Unless we’re in on the joke, too. And especially if Duke is the punchline. Published: March 20, 2019, 5 a.m.